In July of 2016, Aimee and I moved to Oil City with our three kids (4, 3, and 4 mos. at the time). We had both grown up just southeast of Venango County near the small town of Knox and studied for our undergraduate degrees fairly close to home at Grove City College. Following college Aimee immediately transitioned into graduate studies at Clarion University (MS, Biology) and eventually took a job on the staff of Community Action in Clarion. For my part, I spent two years teaching high school and middle school English in the Grove City Area School District. In the fall of 2007 we managed to fit a wedding into this busyness. 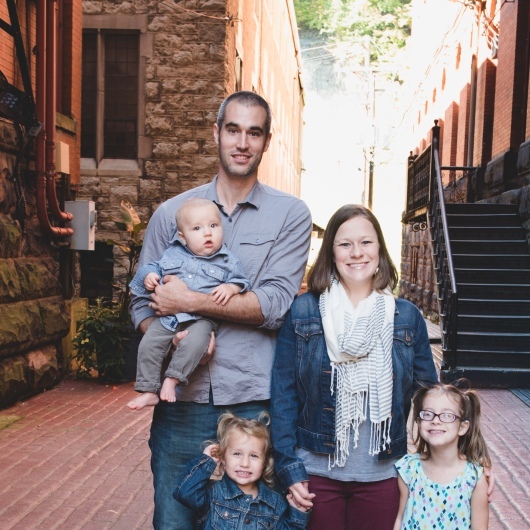 As a newly married couple we began to sense the urge to “get out” and see the world a bit—something we did about nine months later when we moved to New Haven, Connecticut, in part to join in the efforts of a non-profit doing community development work in the city. The timing of our move was anything but fortuitous. About three months after we unpacked our things the Great Recession stymied the American economy. I was working as a carpenter’s assistant at the time. I clearly remember how fast work dried up. Pretty soon it was clear to us that living in New Haven long-term was neither desirable nor sustainable. As we began to think about a transition, both of us were convinced that we needed to get more education. (One can’t live so close to Yale University for long without getting the education bug!) I was intent on attending seminary to pursue the call to ministry that I had felt for years. Aimee was intent on joining the health field. Through a course of events that would take far too long to describe we both landed at Pittsburgh Theological Seminary. We commuted multiple times a week to Pittsburgh from Clarion County. After more trips to Pittsburgh from Clarion County (and more Greek flashcards) than I want to count, Aimee and I both graduated with an MA and MDiv respectively. During seminary I began to discern that my call to ministry was part of a larger call that included teaching and academics. I applied to several PhD programs in history and religious studies and was accepted into the University of Virginia’s Religious Studies Department, where my work was in the subfield of American religious history. (I focused on trying to understand evangelicals in America. No small task!) I was blessed to receive one of the few doctoral fellowships offered by the Jefferson Scholars Foundation. The income from this fellowship was vitally important, as our family grew from three to five during the course of the program. I graduated from UVA in May of 2017 with a PhD in Religious Studies. So why did we move from Charlottesville, Virginia to Oil City? There are several reasons. Anyone who knows what it’s like to raise kids without a family support system knows how difficult it can be to keep the wheels on without grandpa and grandma’s help from time to time. When we added our third child we knew that we were now outnumbered (a scary thought!) and could use a few more sets of hands. On top of this, Aimee and I both grew up with family close by, and we hated to think about our kids’ primary contact with their grandparents, aunts, uncles, and cousins coming through a screen. Added to this was the fact that Clarion and Venango Counties felt like home to us. We loved knowing our neighbors and seeing friends at the store. We simply couldn’t manufacture this small-town, home-town ethos somewhere else. Of course we moved back knowing that small-town America has some limitations that we didn’t encounter in the large college towns and cities where we had lived over the last decade. We also realized, however, that Venango County also held significant opportunities, especially for young, entrepreneurial professionals. It seems to us that urban centers abounded with young people looking for their big break and throwing creative ideas and energy out the window hoping that they might land on a bit of open, freshly tilled earth where they could take root. The problem was there wasn’t much open earth in many of these places. Either rent was astronomical, or the market was saturated, or competition in one’s field was so fierce that it was virtually impossible to eek out a living. On top of all this, the urban-centric pull among millennials is so chic right now as to be almost off-putting. Perhaps, it’s actually more avant garde to actually settle into a small place and be part of a truly grassroots effort. And hey, you can actually buy a house here! Both of these factors were influential, but it was the sense of call that was determinative. We sensed that God was speaking to our hearts about Oil City. We had heard people putting down the town and region for a long time, as if nothing good could come from here, as if this were a forgotten backwater. But we know that’s not how God sees any place in His creation. With God there may be small places in terms of geography, but there are no small places (or people) in terms of significance. When we looked at the natural and social landscape of Oil City and Venango County we had a sense that God wanted us to jump into the array of good that was already happening and also to launch some new good of our own. What launching our own good looked like to us was “planting” a church—Oil City Vineyard Church, (OCV). We began meeting in our house in August and moved into our current home in the National Transit Building’s Great Room in October. Our hope is that we can not only reach up to God but also reach out to each other and our community. More than that, we hope and pray that we can be faithful over the long haul. There are certainly issues facing our town, but there are a host of community members dreaming up creative solutions to address them and there is a God whose heart beats with the rhythm of redemption. Sometimes I think I can almost feel synergy growing under our feet. We are excited to be part of all of this, to thrive and encourage others to thrive here—in Oil City and Venango County.